Marine life experts are looking for answers after a record number of dead whales were reported around Long Island this year. Though final numbers are still pending, both Long Island’s Atlantic Marine Conservation Society and the National Oceanic and Atmospheric Administration Fisheries’ Atlantic branch are reporting a spike in injured and dead whales. 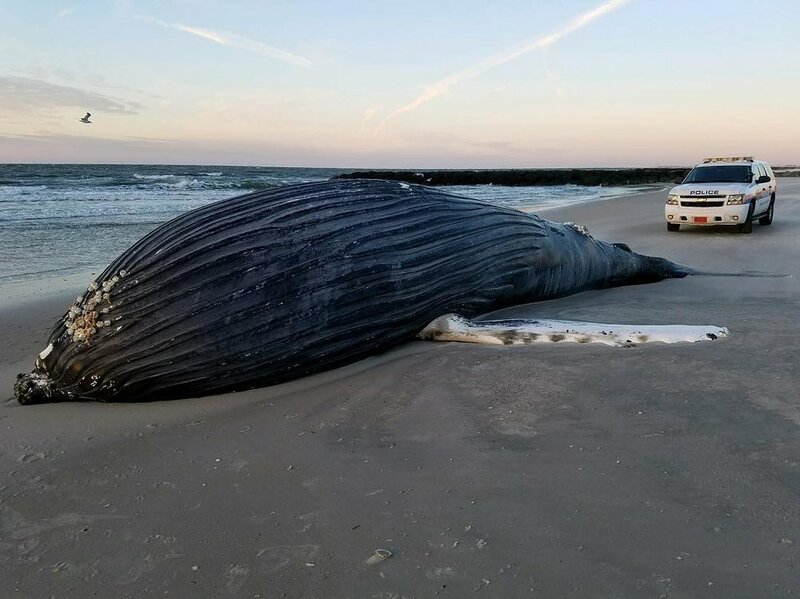 A 33-foot humpback found dead Tuesday at East Atlantic Beach marked the 14th deceased, stranded whale in the society’s New York records this year. Most of the 14 were found on Long Island. For comparison, there were four large whale deaths in 2016, eight in 2015 and six in 2014, according to AMCS. A decade ago, reported deaths were even fewer: just one in 2006 and four in 2007. “This is a very dramatic year we’ve had,” said Robert DiGiovanni, chief scientist and executive director of AMCS, which recently completed its first year of whale stranding response. Scientists say higher whale activity in the area due to increased fish populations could be one reason more whales are being stranded or getting struck by ships. A necropsy Wednesday on the 20-ton female whale at East Atlantic Beach was inconclusive, AMCS said. 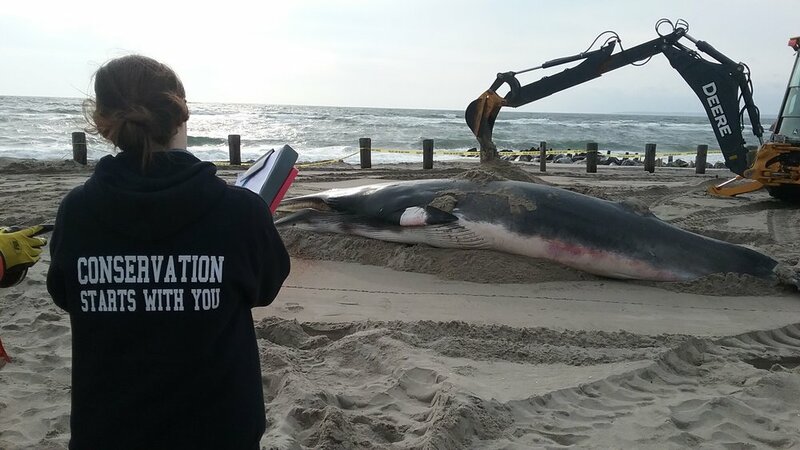 The whale was buried on the beach, which AMCS and NOAA said is the most natural way to dispose of deceased whales. The whale’s death is the latest in what NOAA has called an “unusual mortality event” among humpback whales on the Atlantic coast in 2016 and 2017. Similar deaths also have been seen in other whale species. NOAA experts were not available for comment, but the agency said last month that 58 humpbacks had been reported dead from North Carolina to Maine from January 2016 to last month, with eight of those in New York. Based on necropsies conducted on about 20 of the whales, experts said about half had evidence of ship strikes. Locally, NOAA and AMCS experts aren’t the only ones seeing an increase. Gotham Whale, which tracks whales in the New York City area, has been getting up to seven sightings per day off Long Beach and in the Rockaways. More than half the recent whale deaths Gotham recorded have been caused by ship strikes, said Paul Sieswerda, executive director of Gotham Whale. About 20 years ago, scientists might have seen one whale a year stranding on Long Island, according to DiGiovanni, who has worked in marine conservation for decades. The new frequency is about one every 63 days. One possible explanation is increased populations of fish that whales feed on, like bunker fish, in more urban New York waterways, drawing whales to the area more frequently. In 2015, experts said fish population movements were responsible for a spike in whale sightings in Long Island Sound. But Sieswerda said it’s still unusual to see whales during the winter months, even with more fish. DiGiovanni said scientists are exploring other factors that could bring more whales to shore, like currents. But that work requires data, and he said scientists at AMCS have to wait until testing results from several whales come back in the spring. Read the story and find additional photos from Newsday here.